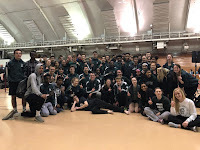 The 2015 track & field campaign kicked off Friday (GIRLS) and Saturday (BOYS) as the Madison Memorial squads traveled to the University of Dubuque in Iowa for their season opening competitions at the AY McDonald Indoor Track. This meet is a starting point for both teams as they look to build upon the success of last season. New events were tried, improvements were made by veteran athletes, newcomers experienced their first track meet, and fun was had been many. The next step is to learn from this meet, work hard every day at practice, and continue to improve. There are 8 weeks until Big 8 conference meets and 10 weeks until WIAA state which leaves plenty of time for improvement but will go by fast...take advantage of every practice & meet! At the Dubuque Invite the girls team scored 17 points to finish in 12th place Friday night while the boys team accumulated 44.5 points for a 5th place finish on Saturday. Both teams showed some great early season success against Iowa schools which were completing their indoor season as Wisconsin just opened up the season competing this week. Hopefully both teams build on this meet to defend their 2014 Madison Indoor City Championship titles this coming Saturday. In the girls meet, points were scored by Delaney E for her 2nd place finish in the 1500m run (5:07.21), Holly H who had a PR of 35' 11" in the shot put for 4th, Phibi M who placed 6th in the 55m hurdles in 9.68, and Izzy O for her 8th place in the 3000m run (11:28.05). Natalie S won the triple jump (which was competed as an exhibition) in a jump of 31' 3", Samantha A took 5th in the JV 55m dash in 8.37, Natalie D took 3rd in the JV 1500m run in 5:56.68, and the JV 4x800 took 7th in a time of 12:04.39. In the boys meet, the following performers scored team points: Jezell T finish 1st place in the long jump with a jump of 20' 10.25", Hunter P leaped 5' 10" in the high jump for 3rd place, Jake A placed 4th in the 55m dash in 6.85, Rory S ran 2:09.50 for 5th in the 800m run, Jonas B placed 6th in the 1600m run in 4:53.32, Casey GT was 6th in the 3200m run (10:38.99), Cole W took 6th in the shot put with a throw of 42' 5", Lance D took 7th in 56.07, Darrion M cleared 5' 8" in the high jump to tie for 7th place, the 4x400m relay placed 7th in 3:43.42, the 4x800m relay ran 8:59.67 for 7th place, the Medley Relay took 7th in 4:01.35, and Alex A placed 8th in 56.20. Dondreon C won the pole vault with a 10' 6" effort and Van T won the triple jump in a leap of 37' 3.5" in non-scoring exhibition events. In JV competitions Dondreon C took 2nd (7.05) while Edward L finished 7th (7.17) in the 55m dash, Gabe B was 4th (5:02.21) and Sam Z 8th (5:24.12) in the 1600m run, the 4x800m relay took 5th in 9:54.82, Edward L was 4th in the long jump with a leap of 17' 4.75", and Reed W was 7th in the shot put in 36' 3". 3rd Quarter ends March 27th...take care of your grades!!!! City Indoor Championships & West Relays (Boys)/TFA (Girls) will take place over spring break...communicate with your event coach your availability NOW as entries will be entered this week. Additionally, event groups will practice at different times Mon - Fri the week of Spring Break make sure to know when your event group is practicing (or what to do for a workout if you need to miss practice).